“on the wallaby” ~ travel outback as a swaggie or sundowner (tramp and casual workers). “on the wallaby track” and “hump the drum” mean the same thing. billy ~ a tin can with a wire handle or a pot. To make tea, water was boiled in it and a handful of tea thrown in. 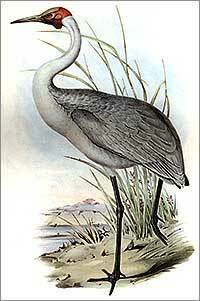 brolga ~ an Australian crane known for it’s elegant mating dance. And the billy’s on the boil). To the lyrebirds mocking tune. Are always on the travel. And what’s that on the coals? And asking us to toil. And the billy’s on the boil.